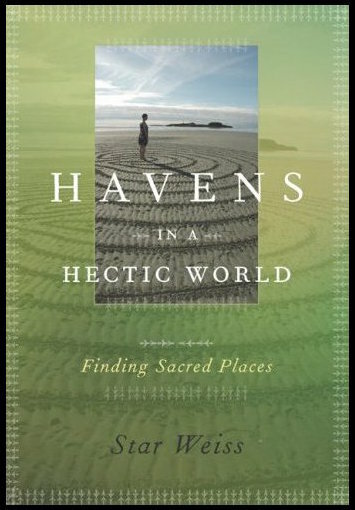 Join author Star Weiss as she explores the spiritual landscape of the West Coast in her newly released book Havens in a Hectic World: Finding Sacred Places (TouchWood Editions, Spring, 2008). In interviews with a wide spectrum of British Columbians, from prison inmates to cloistered nuns; from artists to First Nations Elders, Weiss uncovers and discusses the diverse meaning of sanctuary in our society. From a mountain peak to an ancient village, a waterfall to a labyrinth, from the Ismaili Jamatkhana in Burnaby to Vancouver's Downtown Eastside, each sacred place leads to a deeper inquiry: How can we find sanctuary in a world defined by productivity and efficiency? Where can we seek refuge? How are our connections to the divine changing? With Havens in a Hectic World, Weiss finds powerful answers that will invite you to find your own sacred place. "I think every place is sacred. I have many of them," says Rabbi David Mivasair, Vice Chair of Vancouver's InterSpiritual Centre. "We create sacred space. My five-year-old daughter's bedside, my mother-in-law's kitchen, my garden, the holy blossom temple of a cherry tree....It's really about opening our eyes, opening our hearts, opening our soul to where we are. It's our attunement to what is there that makes it a sacred place." Douglas Todd, Ethics and Spirituality reporter for The Vancouver Sun, says, "Star Weiss has put together an incredibly well researched and engagingly written exploration of what it means for a place to be 'sacred.' With the fresh eyes of a former New Yorker who has long been enchanted by her wild, mysterious chosen home on the West Coast, Weiss takes the reader on a thoughtful journey into the heart of contemporary spirituality."